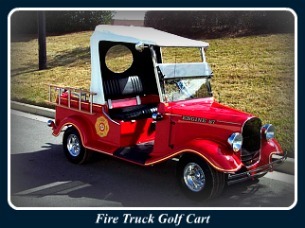 We performed an extensive search for manufacturers of Custom Golf Carts and to our surprise we found some real jewels! Listed below are just a few of the most interesting for you to look at and investigate. We have listed only one Custom Golf Cart for each manufacturer, but when you go to their website you will find they have numerous carts available. The vehicles are the ultimate in motorized golf carts! For your convenience we will specify the websites where you can find and evaluate these unique Golf Carts. Photo Courtesy of L.A. Concept Cars, Inc. This California-based company represents several well-known golf cart manufacturers such as Yamaha, E-Z Go, and Club Car for parts and accessories. They are distributors for unique items such as windshields, lift kits, step plates, shocks and springs, steering wheels, and just about any other part or accessory related to Customized Golf Carts. This company has gas golf carts as well as electric golf carts. Photo Courtesy of Diversified Golf Cars, Inc. Team spirit is greatly enhanced by this seven foot tall mobile football helmet. 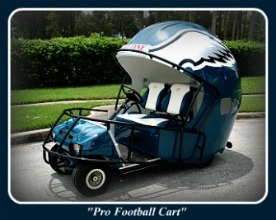 This one-of-a-kind golf car is seen at every Philadelphia Eagles home football game. This unique golf cart features a one-piece fiberglass helmet shell with an all aluminum face mask. Diversified Golf Cars, Inc., based in Orlando, Florida prides themselves on manufacturing the most complete and wholly unique line of specialty vehicles and custom golf carts available anywhere. With a complete in-house production facility not only can they offer a fully-customizable product line but with great customer service and reasonable prices. Some of their major products include; Custom Golf Cars, Ambulance Golf Cars, Wheelchair Accessible Golf Cars, Passenger Tram Trailers, and general Utility Golf Cars. In 2010, Diversified Golf Cars became an official dealer for Yamaha Golf Car Company and their impressive line of golf, transportation, and utility vehicles. This strategic partnership allows them to greatly reduce production times while furthering their ability to offer clients unbeatable value on their investment. Photo Courtesy of Luxury Carts, Inc. 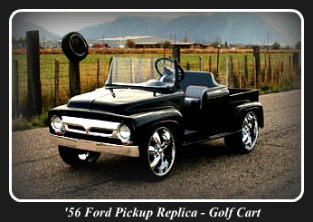 The Standard Options for this unique Custom Golf Cart: '56 Ford pickup body design, Brake lights, Headlights, Cherry Wood Inlaid Bed, Marine Grade Vinyl Seating, Turn Signals, Hand Laid Fiberglass Body, and 48 Volt Club Car Chassis. The Optional Features for this golf cart: 17" Rims, Chrome Tilt Column, Leather Seats, Alpine AM/FM/CD Stereo, Tinted Windshield, and a Golf Bag Holder. These units can be a gas golf cart or electric. This Hawaiian based company provides the largest selection of custom golf carts and cool custom golf kits on the market. The list includes; Cadillac Escalade Cart, Lamborghini, Brooklyn, Hummer, Roadster, Humdinger, Viper, Jeep, Ram, Mercedes, Corvette, Mercedes, '57 Chevy, Mustang, and many more! These Custom Golf Carts are modified body styles bolted onto a newer Club Car Chassis. These are truly unique carts which can be used on or off the golf course. Luxury Carts, Inc is dedicated to providing the highest quality products and dedicated professional service. They offer a "Made to Order" program to design and build the custom golf cart of your dreams. In addition to selling carts to individuals and companies, they can also help you set up your own "Luxury Carts" distributorship. Photo Courtesy of Caddy Works, Inc. The “BullPen Cart” is available for high school, college, or professional baseball games and everywhere else you would take a Specialty Sports Vehicle. SSV shells are made of fiberglass and are strong, durable, and lightweight. They provide excellent protection from weather while making a statement of class, origin, corporation or personal expression. Virtually any color or paint scheme is available as are graphics and logos. Custom Caddy Werx is a Colorado company and the home of the Specialty Sports Vehicle (SSV). Whether you desire a personal Custom Golf Cart for the course, or a street-legal advertisement for your business, Caddy Werx is the only stop you need to make. Do you have a special design or a creative idea for a unique golf cart? Caddy Werx can apply it to your custom golf cart. Custom carts from Caddy Werx have been featured in Colorado Golf Magazine. 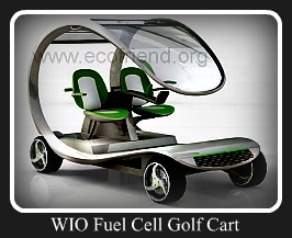 Photo Courtesy of Eco Friends, Inc.
What is a fuel cell? A fuel cell is a device that generates electricity by a chemical reaction. Every fuel cell has two electrodes, one positive and one negative, called respectively the anode and cathode. The reactions that produce electricity take place at the electrodes. Every fuel cell also has an electrolyte, which carries electrically charged particles from one electrode to the other, and a catalyst which speeds the reactions at the electrodes. Hydrogen is the basic fuel, but fuel cells also require oxygen. One great appeal of fuel cells is that they generate electricity with very little pollution, where as much of the hydrogen and oxygen used in generating electricity ultimately combine to form a harmless byproduct, namely water. How do fuel cells work? The purpose of a fuel cell is to produce an electrical current that can be directed outside the cell to do work, such as powering an electric motor or illuminating a light bulb or a city. Because of the way electricity behaves, this current returns to the fuel cell, completing an electrical circuit. The chemical reactions that produce this current are the key to how a fuel cell works. This cart definitely trends toward the ecological extreme: it is constructed entirely of vegetable composites and emits zero pollutants. To our knowledge, this car is in the design and theoretical stage and not yet in production. We have not yet found a manufacturer for this "Super Cell Cart", but we will keep looking! But isn't that a really Cool Golf Cart? Designed by Stephanie Wackernagel, this futuristic golf cart integrates style with substance and design with utility and green features. This unit is the motorized golf cart of the future! Photo Courtesy of DG Custom Golf Carts, Inc.
A Jacksonville, Florida based manufacturer, DG Custom Golf Carts has fourteen years experience in the business of designing and creating Custom Golf Carts exclusive to your tastes and needs, from basic to customized carts, hunting vehicles, utility vehicles and much more. After being in the business of restoring classic cars and hot rods it was natural for them to carry the same type of meticulous care into what they do now. 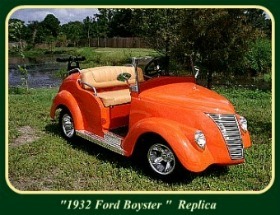 Photo Courtesy of Capistrano Golf Cars, Inc. The golf cart above, a "Red Lido Golf Car" is considered an Extreme Golf Cart by many designers. 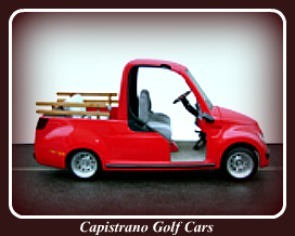 Capistrano Golf Cars prides itself in producing fine Golf Carts such as this one. A California based business; Capistrano Golf Cars serves LA & Orange County with great service and sales for new and used electric and gas golf cars. They service almost any brand, and have a complete line of accessories for your golf cart. 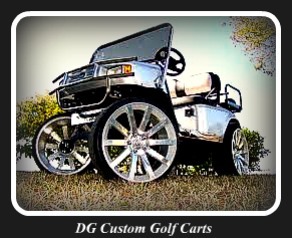 They can also provide you with rain covers and custom wheels to personalize your golf car. 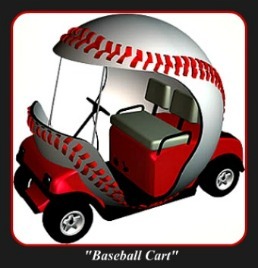 Capistrano Golf Cars has rentals for just about any occasion, such as sporting events, weddings, and much more. Photo Courtesy of StreetRod Productions, Inc. This Iowa based Kustom Kart manufacturer builds the world's finest Kustom Golf Carts! The Streetrod Kustom Kart is not a Kit! Each Kustom Kart is built to the customer's specifications. Streetrod Productions, Inc. hands-on craftsmanship assures you the most dependable performance available on the custom market today. Whether you are an avid golfer, estate owner or streetrod buff who likes to "cruise in style", your Kustom Kart will give you years of enjoyment. Photo Courtesy of Travelizmo, Inc. 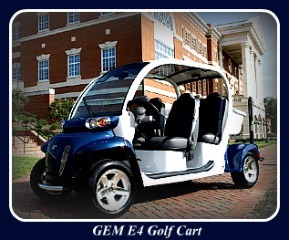 This GEM e4 Golf Cart will sit four people comfortably for a foursome on the greens or a trip around campus. Thanks to its six 12-volt flooded electrolyte batteries, this Custom Golf Cart will take you up to 30 miles on a single charge. For your added comfort it comes complete with a sunroof. You can store ample supplies in a lockable cargo trunk. Features include quartz-halogen headlamps, an on-board 72-volt DC charger, hydraulic brakes and parking brake, along with three point safety belts. This is truly a quality vehicle built by Global Electric Motorcars. These are “Street Legal” golf carts. We hope you have thoroughly enjoyed your trip through Custom Golf Cartland! We were amazed at the ingenuity and creativity applied to golf carts. Aren't they wonderful?